This headset is a more than a standard headset. The Voyager Focus has some advanced stuff build in. When you take of your headset while playing music, the music pauses. When you are in a Skype for Business meeting and you turn your microphone up or take of your headset it will mute you. This is all work of the Smart Sensors Plantronics has built in. The Active Noise Cancelling of this headset is working as you may expect. The comfy headband and ear cushions feel light on your head and ears. The audio quality is really good to be called almost sublime. Another cool feature of this headset is the OpenMic button, this way you can leave the headset on your head and listing in, in the room. Also the battery life is phenomenal, up to 12hours! There is one thing i dislike, (re) connecting the headset after being idle for a while. 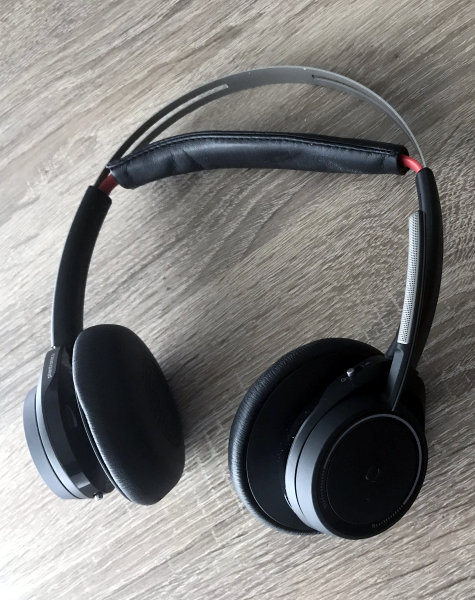 Like i mentioned above i’m using this headset mostly for Skype for Business meetings and sometimes the connection is lost. When someone calls me it takes up to 20 seconds before the headset is connected again to my laptop, the calling party already hangs up (timer setting in Skype for Business) and i need to call back the person.